This Masters course will give you a completely new insight into how language really works and the way people use words to create meaning. If you would like to learn how to explore language using innovative techniques and computer tools, then our course will offer you cutting-edge, research-led training of the highest quality, taught by leading researchers in the fields of linguistics and computer science. - Using computer tools for teaching and translation. The course will enable you to develop interdisciplinary knowledge and practical, transferrable skills, enabling you to meet the most recent and relevant demands of the field. If you are interested technological aspects of language study, you will also have an option to learn basic computer programming – a skill that is increasingly sought after by companies seeking to employ language professionals. As a Masters student on this course, you will be part of our Research Institute of Information and Language Processing (RIILP), an independent, research-driven University unit specializing in linguistics and natural language processing. Join our team of international researchers and start exploring language now! This course will introduce you to the use of corpora – large electronic collections of written and/or spoken text that serve as a reliable source of evidence in linguistic analysis. (‘Corpora’ is the plural of ‘corpus’.) You will learn how to design, analyse, and exploit corpora in language teaching, dictionary writing, and translation for English or any other language. You will be given freedom and flexibility to tailor the course content to your needs and research interests as we offer a unique selection of general and specialized elective modules from which to choose. Our teaching staff will provide you with support and guidance in selecting the most suitable combination for your research topic. Semester I will focus on developing general linguistic knowledge and research skills, which you will be able to apply to your chosen area of expertise in Semester II. You will learn about words, meanings, and linguistic creativity, broaden your knowledge of grammar, and acquire basic research and professional skills. You will also have an opportunity to learn the essentials of computer programming by attending our elective module in Python. 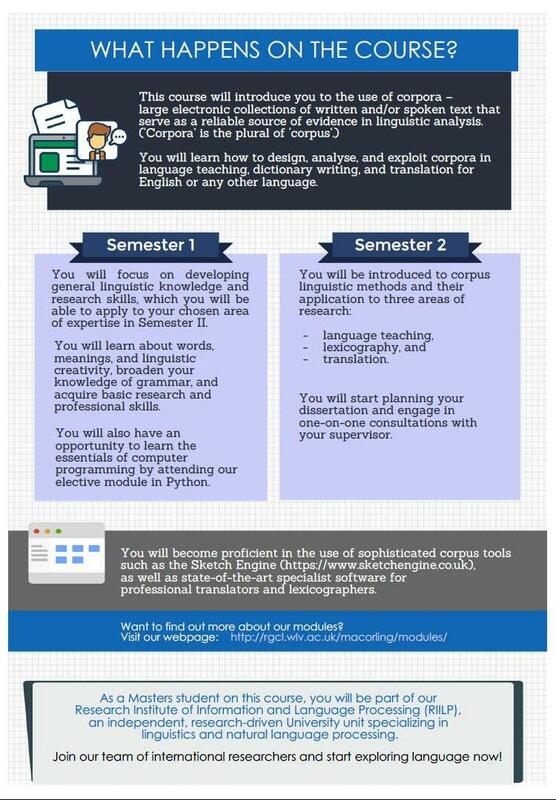 Semester II will introduce you to corpus linguistic methods and their application to three areas of research: language teaching, lexicography, and translation. You will start planning your dissertation and engage in one-on-one consultations with your supervisor. You will be expected to dedicate 9 hours per week to lectures and a proportionate amount of time to self-study and tutorials with your supervisor. - You will be taught by leading researchers in the field: our teaching staff at the Research Institute of Information and Language Processing (RIILP) are engaged in high-quality research, as evidenced by the latest RAE 2008 and REF 2014 results. - The institute has a wide network of contacts in academia and in the industry which you will be able to benefit from. - You will also have an opportunity to travel the world – Malaga, Naples, Valencia, Besançon, Plovdiv, and Alicante are just a few of the many possible destinations covered by our institute’s Erasmus agreements. Professor Hanks is a world-renowned researcher in the fields of lexicography, corpus linguistics, figurative language, and onomastics. His curriculum vitae includes prestigious posts in the publishing industry: he was Chief Editor of English Dictionaries at Collins Publishers and subsequently Chief Editor of Current English Dictionaries at Oxford University Press. More recently, he has held research posts and taught linguistics and lexicology at undergraduate and postgraduate levels in Britain, America, Germany, and the Czech Republic. He was lead researcher on an AHRC-funded project titled ‘Disambiguation of Verbs by Collocations’ (DVC) at RIILP, which aimed at creating the 'Pattern Dictionary of English Verbs', a large, corpus-driven lexical resource for English verbs. Prof. Hanks serves on the editorial board of the International Journal of Lexicography and the International Journal of Corpus Linguistics, and on the programme committees for conferences in computational linguistics, lexicography, and phraseology. He is an honorary life member of the European Association for Lexicography. Dr Moze specializes in Corpus Linguistics, Mono- and Bilingual Lexicography, Frame Semantics, and Translation Studies, and has 10 years of research experience working in the development of corpus-driven methodologies, annotation schemes, tools, dictionaries, pedagogical grammars and other linguistic resources for various languages. She is one of the main researchers working on the 'Pattern Dictionary of English Verbs', which is currently being developed at RIILP under the guidance of Prof. Hanks. She has also co-authored a book titled ‘Analysing Student Language Problems: A Corpus-based Approach’, which focuses on the application of corpus linguistic methods to language teaching. Dr Orasan has more than 15 years of experience working in many fields of human language technologies, including text simplification, automatic summarisation, information extraction, machine translation, question answering, and corpus building. He is the Coordinator of the FP7 ITN EXPERT project (http://expert-itn.eu). He was the local coordinator of the Erasmus Mundus Masters in NLP&HLT and deputy coordinator of the FIRST project. He has supervised 6 completed PhD thesis, more than 20 masters dissertation and is currently supervising 4 PhD students. 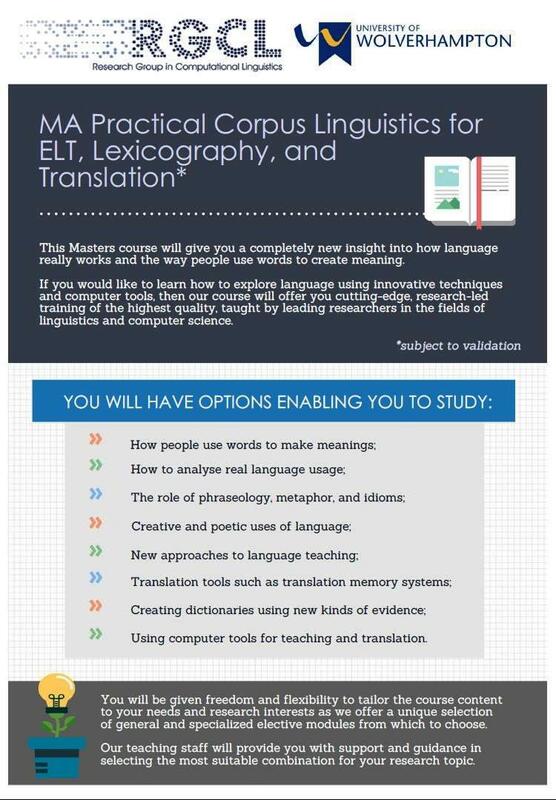 MA Practical Corpus Linguistics for ELT, Lexicography and Translation is an innovative, unique, and up-to-date course based on high-quality interdisciplinary research, with a selection of modules that is unparalleled both on a national and international level. Our research-led teaching is continually evolving to address the latest challenges and breakthroughs in the field. As a result, the knowledge and practical skills developed on the course will allow you to meet the most recent and relevant demands of the industry. You will become proficient in the use of sophisticated corpus tools such as the Sketch Engine (https://www.sketchengine.co.uk), as well as state-of-the-art specialist software for professional translators and lexicographers. You will also be given an option to learn basic computer programming in Python, which is one of the most robust, popular, and widely used programming languages in the field. By the end of the course, you will have developed a unique set of transferrable skills that will make you highly competitive in the marketplace and allow you to find employment as a language professional in industry or in academia. 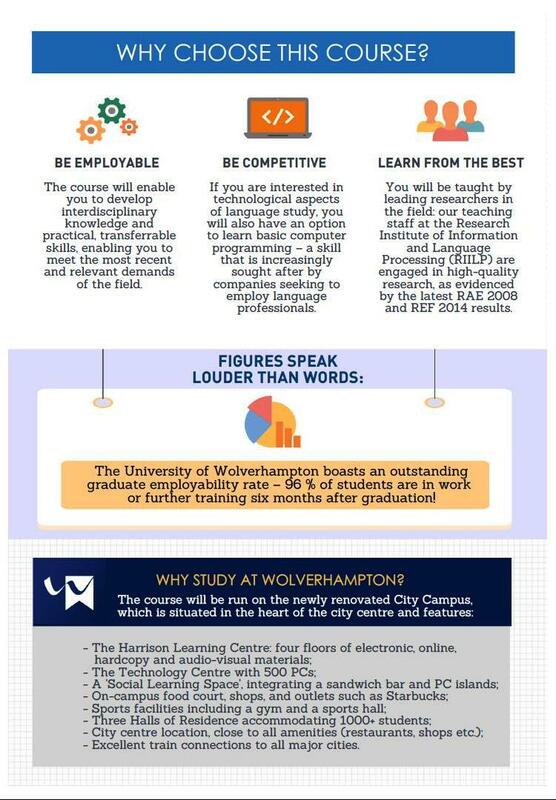 Figures speak louder than words: the University of Wolverhampton boasts an outstanding graduate employability rate – 96 % of students are in work or further training six months after graduation! The course will be run on the City Campus, which is situated in the heart of the city centre, only a seven-minute walk from both the train station and St Georges Metro terminus, and a five-minute walk from the main bus station. - Excellent train connections to all major cities (Birmingham: 20 minutes, London: 1 hour 50 minutes). Graduates will be able to pursue a career path in language teaching, translation, lexicography, editing, and human language technology, working either as freelancers or in a variety of industry locations, including publishing houses, translation agencies and IT companies that specialize in the development of language resources and tools (e.g. language learning applications, CAT tools). English language teachers will benefit greatly from the course, as they will develop knowledge and practical skills in using modern lexical resources, corpus data and tools in the preparation of teaching material and in the classroom, which will significantly improve their chances of securing a job in the ELT sector. The course will also provide a sound intellectual platform for students to progress onto doctorate level study and a career in higher education. 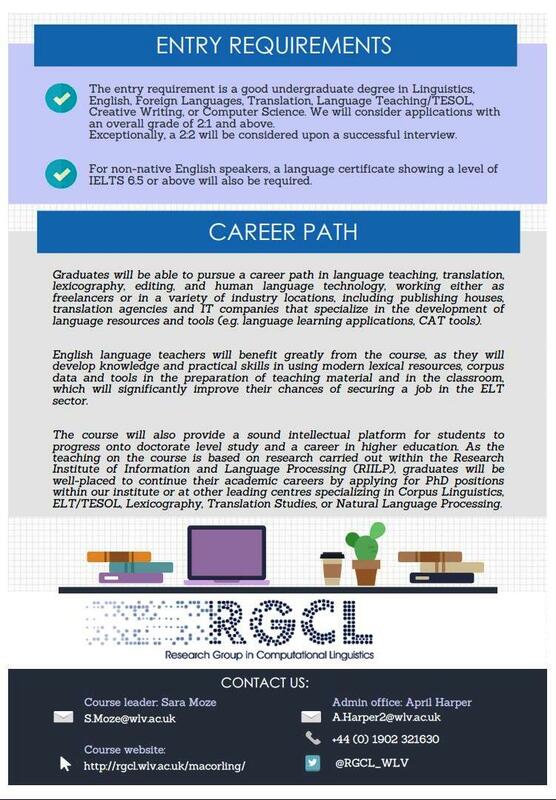 As the teaching on the course is based on research carried out within the Research Institute of Information and Language Processing (RIILP), graduates will be well-placed to continue their academic careers by applying for PhD positions within our institute or at other leading centres specializing in Corpus Linguistics, ELT/TESOL, Lexicography, Translation Studies, or Natural Language Processing. - ability to handle constructive criticism and avoid conflict. The entry requirement is a good undergraduate degree in Linguistics, English, Foreign Languages, Translation, Language Teaching/TESOL, Creative Writing, or Computer Science. We will consider applications with an overall grade of 2:1 and above. Exceptionally, a 2:2 will be considered upon a successful interview. International students will need IELTS 6.5 (or equivalent) with a minimum score of 6.0 in every element.